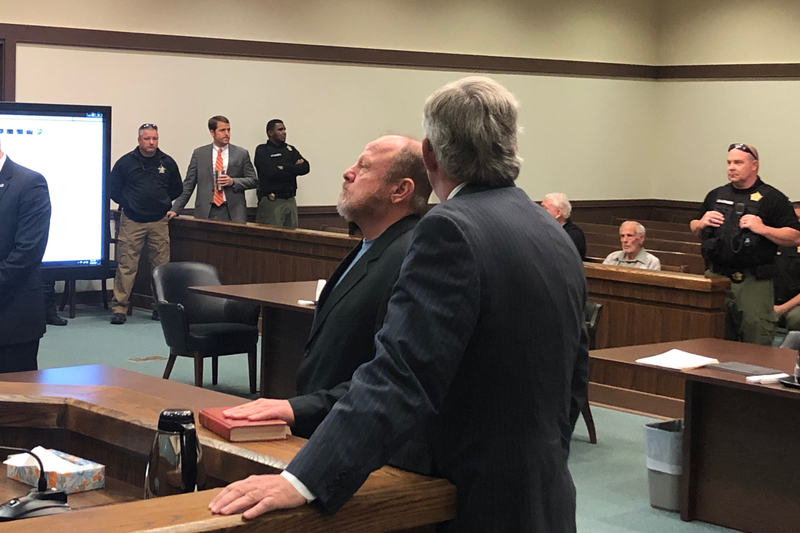 Ronald Derossett, left, stands before the court with his attorney, Bill Yarbrough, during a plea proceeding Friday morning. Laurens, S.C.; March 22, 2019 — A Greenwood man will spend the next 17 years in prison after pleading guilty Friday morning to two counts of felony DUI in connection to a 2017 incident that cost two Greenwood men their lives, 8th Circuit Solicitor David M. Stumbo announced Friday. Ronald Lee Derossett, 58, pleaded guilty Friday morning at the Laurens County Courthouse to two counts of felony DUI resulting in death, two counts of felony DUI resulting in great bodily injury, possession of marijuana, and driving under suspension. Derossett was scheduled to go to trial beginning April 1. Derossett was facing up to 25 years on the charges related to the death and up to 15 years on the charges related to the injuries. Circuit Judge Donald Hocker then handed down a sentence of 17 years in prison on each of the felony DUI resulting in death charges, 10 years in prison on each of the felony DUI resulting in great bodily injury charges and time served on each of the possession of marijuana and driving under suspension charges. The sentences will run concurrently and the court ordered Derossett to pay $15,200 in fines in addition to the prison sentence. On the evening of May 5, 2017, Derossett was traveling west along Highway 72/221 from Laurens to Greenwood near the Lander University Equestrian Center in his 1999 Jeep just before 9 p.m. when he attempted to turn left onto Evans Pond Road. Derossett never slowed down when making the turn and hit two motorcycles traveling east. The motorcycles were being driven by 45-year-old John Ruley and 57-year-old Tommy Burdette. Each of the motorcycles also had a female passenger. Ruley and Burdette were both pronounced dead at the scene. The two female passengers sustained significant injuries that will likely last many years. Derossett’s blood-alcohol level, which was tested by the State Law Enforcement Division, was .205, significantly higher than the state’s legal limit for intoxication of .08. Derossett has a criminal history dating back to 1982. The convictions came from four different states and most were substance abuse related. Solicitor Stumbo and Assistant Solicitor Karissa O’Keefe-Young handled the case for the state with assistance from 8th Circuit Solicitor’s Office Investigator Michael Cox and Victim Advocates Mary Ann Stroup and Sarah Parris. Derossett was represented by Bill Yarbrough of the Greenville County Bar. Solicitor Stumbo praised the work of his staff in preparing the case as well as the thorough investigation by the state Highway Patrol, in particular Sgt. Jamie Brown and the accident reconstruction team investigator Sgt. Tommy Brooks, in securing the conviction and lengthy prison sentence.